DMG Media Ireland has unveiled details of its first TRENDS survey which provides advertisers with a bespoke targeting tool that allows them exclusive ownership of trending cultural moments, conversations, breaking topics and personalities in real time across all its platforms. Launched in June, DMG Media has already partnered with a number of brand advertisers targeting ‘Love Island’ trending content. One of the surprise hits of the summer, Love Ireland has generated plenty of coverage on a number of platforms. 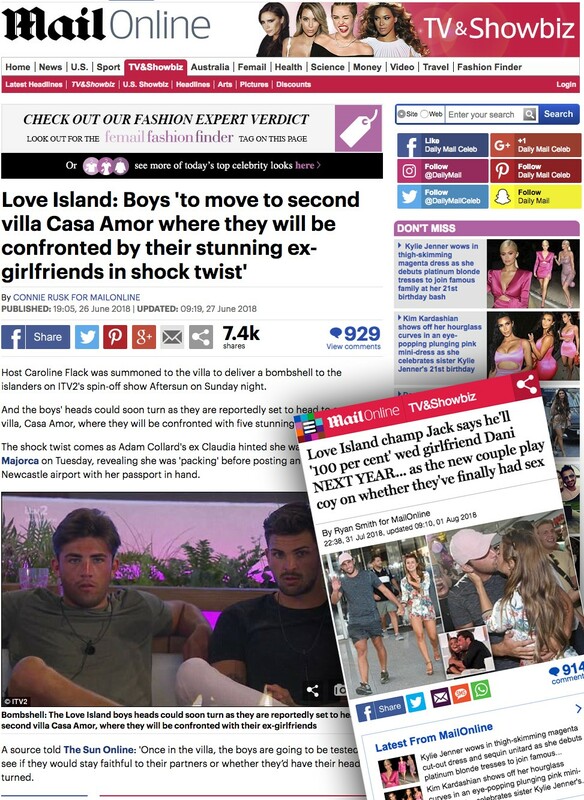 According to the publisher, after just six weeks Mailonline Ireland published over 1,500 Love Island articles, consisting of 3m article reads, 34,000 images and an average dwell time of three minutes per article. According to Doug Farrell, Group Head of Digital at DMG Media Ireland: “We are very happy to have tested the first ‘TRENDS’ campaign. Following the staggering response to the Love Island content we are delighted to have delivered engagement KPIs far and beyond our client’s expectations. In addition to the fantastic response, we have built a bespoke and comprehensive 1st party Love Island audience data set that can now be utilized thought the coming years allowing brand clients to target this highly engaged mass audience”.